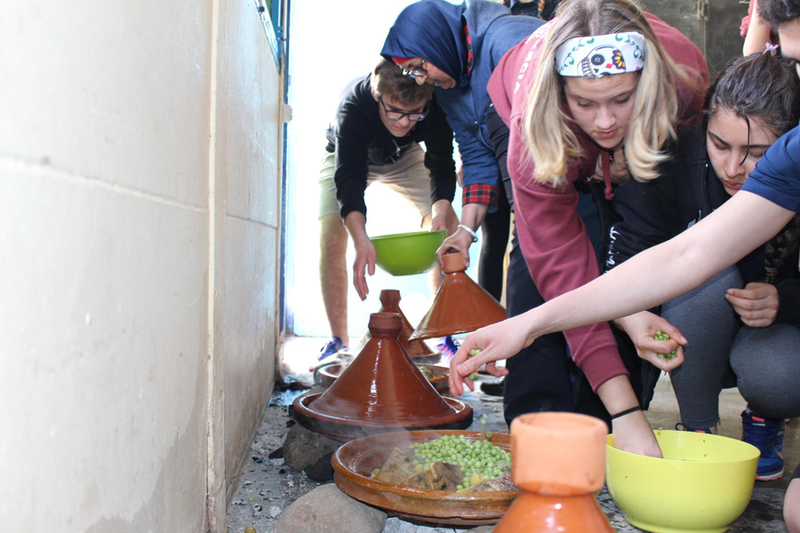 Students in the Mission Morocco Global Service Group traveled to Morocco in late February to work with underprivileged or abandoned children and help improve their access to education. Prior to the trip, students examined the broad spectrum of issues related to development, such as education, women's rights, children's rights, and accessibility. Karen Corda ’18 recapped this year’s trip. 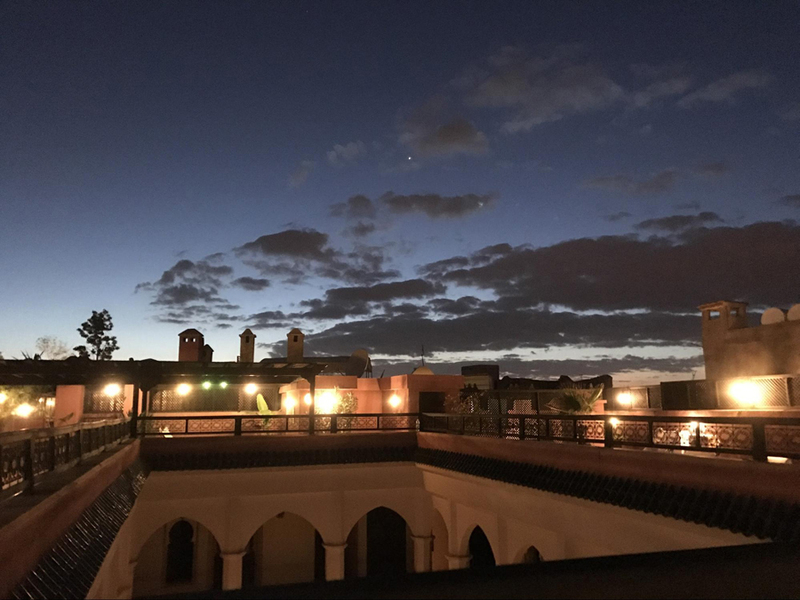 We arrived in Marrakesh, Morocco, where most of us had never been. We all came to do a humanitarian service trip and will be working mainly with two schools. The first school is Hayati, which helps children aged 0–6 before they start elementary school. The second school is named Sanady and provides a strong education to talented high school students. Before we started working with them, we discussed what limitations these schools had and how we could help them during our visit. We discussed our different goals and expectations for our Mission Morocco Global Service Program trip. We departed Marrakesh and traveled to the Hayati school, which is near Agadir. This was our first visit, and there weren’t any children in the school at the time. We talked with the founder of the school and the teachers. They explained to us the different situations that the mothers of the children from the school have. The Hayati school offers help to single mothers that need to work to support themselves and their children. Even if the children are too young to attend the school, mothers can leave their children at the school when they go work because no one else can take care of them. Most of these women are excluded from society and rejected by their family for having children outside of marriage. Also, the school makes sure that these children are legally recognized and helps the mothers contact their families. 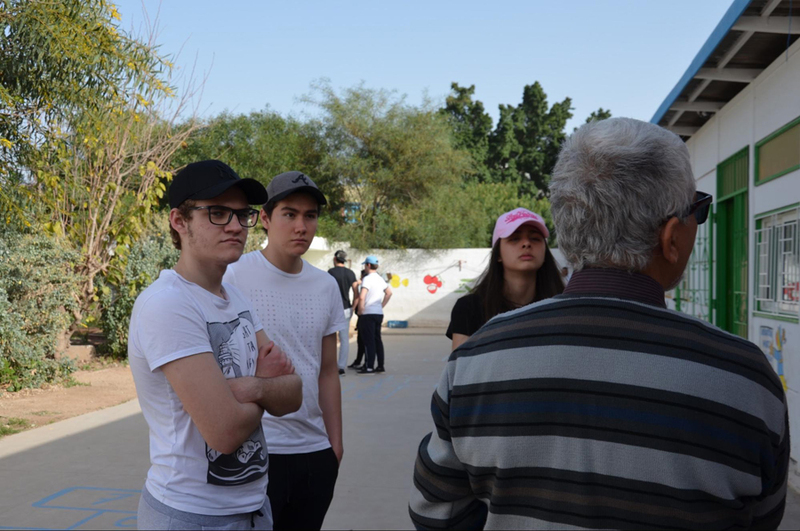 At the end of the day, we had a group meeting to discuss our first impressions of the Hayati school and its facilities. We talked about what Mission Morocco will do and how it could benefit this community. This was the day we got to meet the children of Hayati. As soon as the older children saw us, they started smiling. These children were holding hands while playing together, and when they saw us arriving they ran away because they were shy. The younger children, the ones with whom we were going to work, were waiting for us in the classrooms, and they also changed their expressions completely. We then divided them into groups to have different activities with the children and teach them some words in English or French. While we were teaching them languages, some other TASIS students were teaching each child how to type. The children were excited to be able to do activities with us, and we could see this in their smiles. Those of us not teaching were playing outside with the children while they had their morning break. We then alternated to give an equal amount of attention to every child. While the lunch for the children was getting prepared, some of us were helping in the kitchen, others were playing with the children, and the rest were helping the teachers wash every child’s hands and teeth before lunch. Lunch was then served by the teachers and us to the children. We sat down at the table with them to help them eat. When we finished working with the children and they were done with their lunch, we departed and went to meet the leader of the Sanady School. In the afternoon, we got to know these talented students who are brilliant in school. We visited their town and also walked through and orangerie. After the tour, we had dinner with them and talked about our different lives. In the morning we went to visit a local factory. It was a fish factory where a lot of the mothers from the Hayati school work. In the morning they drop their children at the school, and then they go to work in the factories. Visiting the factory opened our eyes to the reality of what these mothers have to go through. The time shifts of the workers are long, and sometimes they even work at night. As Hayati is aware of this, they are prepared to take care of the children for not only the entire day but also at night. To make the mothers responsible for their children and present in their lives, Hayati has a rule that when the mothers are done with their night shift, they have to go and pick up their children themselves. They believe that a mother should be present as much as she can in the child’s life. After seeing where some of the mothers of the children work, we then went to the Hayati school. The Hayati Foundation is divided into different buildings. That afternoon we went to visit the smallest children, who are from 0–3 years old. I realized that most of the babies were sick, such as having a cold and not being able to breathe properly, so I asked one of the teachers who was taking care of them about their health. She answered that they were aware that most of them are sick but that it is tough to keep all of them healthy and that the doctor comes as soon as he can, which is a few times in the month. Today the Hayati school has organized a little party for us where we contribute by doing activities with the children. Before going to the school, where the children were waiting for us, we went to buy three televisions with the money that we raised. When we arrived at the school with the televisions, the teachers and the leaders of the Hayati school were very happy because they will help them teach the kids with more resources. We then prepared typical meals with the teachers and cooked all morning. We then had the little party. As the tagine was taking a few hours to be cooked, we all planted a tree. The party then started, and all the children danced and played some games that we taught them earlier in the week. That day ended with the party, and by then we were done with the work we had planned to do with the kids. 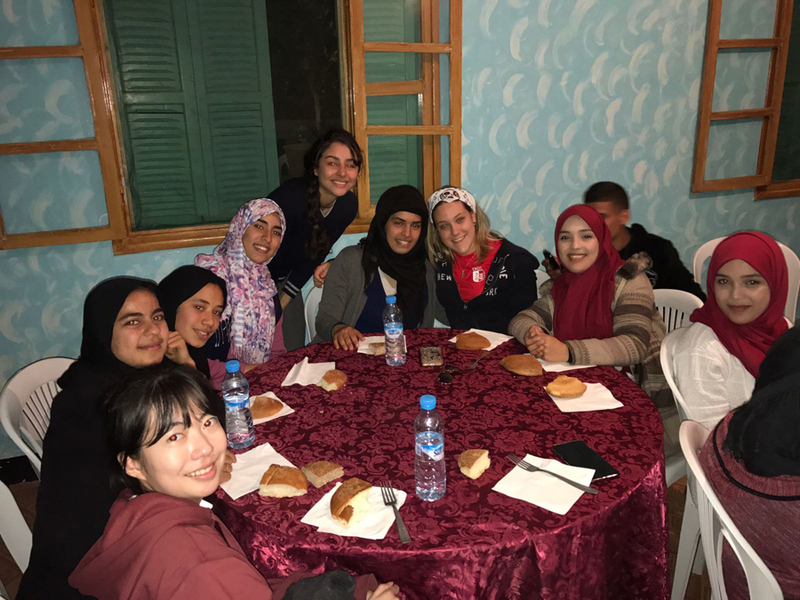 We finished the night with a typical Moroccan dinner and traditional dances—dressing in their cultural costumes and following their traditions. We planned to have a day trip with the children from Hayati. 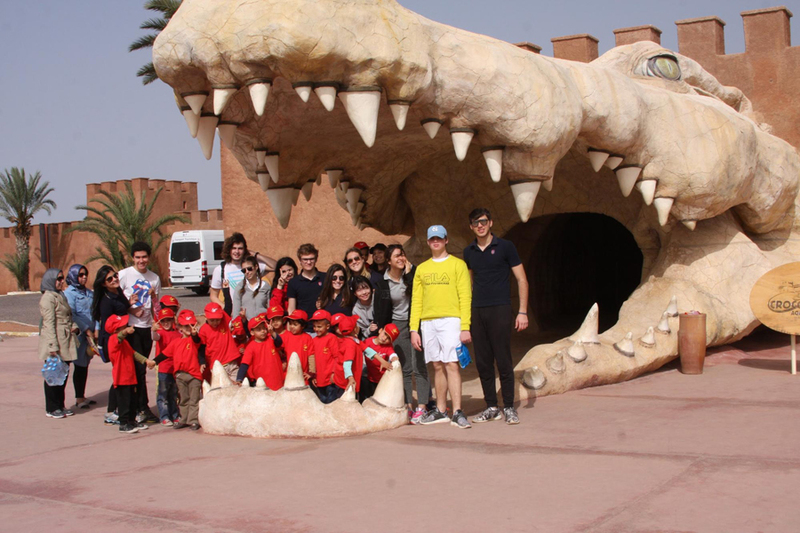 Most of them had never been to the CrocoPark that is in Agadir, so we took them to see crocodiles. They were all very excited about the idea, and then when they saw the crocodiles they were very impressed. We divided so that each one of us was with one or two children at the park. After we went to the park, we then had an activity with the children in which we painted their faces. We then said goodbye to the children who remained in the park. It was very difficult to say goodbye to them. We had created strong attachments, and it was clear that they understood we wouldn’t be coming back and their sad faces reflected this. We were leaving a part of ourselves there, as we had been intensively working with these children. We also learned about and discussed the difficult home situations that many of these children were living through. As we left, we could only hope that we had helped them and made even a small difference in their lives.